Section two contains 55 photos including the descriptive photo. Some of Vernon Miller’s highest quality black and white photos are in this section. It is from the black and white films that we can appreciate the positive view of the Man of the Shroud who was hidden in the negative image of the man on the cloth until the first photograph of the Shroud was taken by Secondo Pia in 1898. 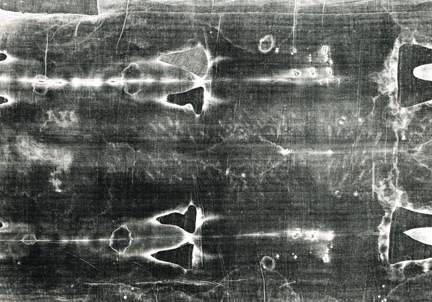 As stated in the introduction, this remarkable discovery rang around the world in 1898 and is the reason that many scientists began to study the Shroud. 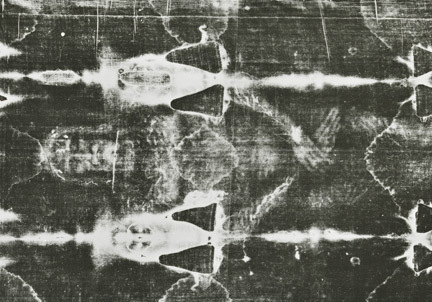 Moreover, on examining the Shroud as you see it (positive photo) the blood marks are seen as positive and on the negative photo the blood marks are seen as negative. 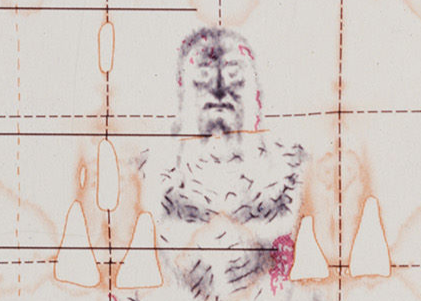 In contrast to the unique image, the blood marks of the Shroud have the classic results of what is expected when blood is photographed; the same is true of the patches, burn marks, etc. seen on the cloth. In this section there are many 8 x10 black and white films which illustrate Vernon’s photographic and dark room expertise. He used different exposure times, etc. to produce very fine black and white positive and negative photos of high contrast that resulted in the clearest features of the Man of the Shroud. In 1978, Kodak film was used along with specialized techniques to provide the best photographic outcome. Today they are still used but only by a few since the digital age now dominates the photo industry. Some of these older photographic techniques used by Vernon Miller are mentioned in some of his notes which are included, if available, in the individual descriptions of the photos. The information provided below may be of some use to those who are interested in reading Vernon’s notes and attempting to understand how these photos were produced. 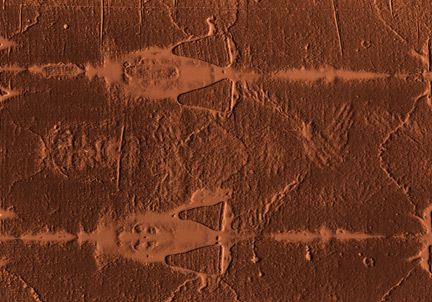 These full images are made up of three photos that were produced from three separate parts of the Shroud. The three parts included: Frontal-Dorsal Torso upper, Frontal Torso lower, Dorsal Torso lower (middle: the front and back of the head, one end: front lower legs, other end: back lower legs). These three images were then cut to size and placed together to create a full image of the Shroud. The combination of these three images that make up the full image is called a mosaic. 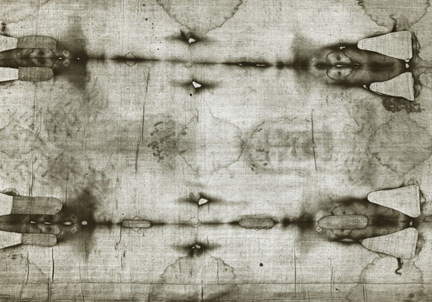 By photographing three images instead of one, he increased the resolution of each part resulting in a much higher quality image of the Shroud. In this section, group b, Full Image, Positive & Negative are examples of full images produced in the manner as mentioned above. Group e, which contains Matched Three Piece Full Images (Mosaic), Positive & Negative is a group of photos that are wonderful examples of the three-part images that can be used to create the full images. Vernon photographed high quality 8 x 10 color transparencies of the Shroud (see Color Transparencies 8 x 10) by using the technique of taking three photos: the middle, one end and then the other end as described above. He used these transparencies to create high quality black and white 8 x 10 negative photos that enhanced the remarkable positive image of a man. He did this for the purpose of increasing the contrast so that the image of the man could be better visualized. This was done by a process called High Contrast Contact. An original Ektachrome transparency of the Shroud was placed in contact with an 8 x10 Panchromatic or Tri-X (black and white) film. The emulsion sides of each film were placed in contact with each other; then white light was passed through it for a determined period of time. The Silver Halide of Panchromatic film or Tri-X film have very fine emulsions that produce high quality negatives. 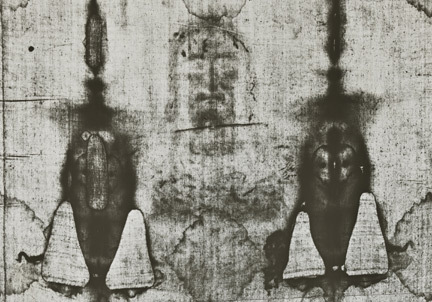 Therefore, the final results were negative photos displaying high contrast positive images of the Man of the Shroud. High Contrast Contacts are seen throughout this section. Other contact techniques are used here, but the above are aids to better understand some of the technical terminology used in this section of photos. Some beautiful examples of High Contrast Contacts include group e, Matched Three Piece Full Images (Mosaic), and group f, Un-matched Images. There are a number of black-and-white 8 x 10 films that are likely contact reversals. Contact reversals are done by placing an unexposed negative over an original negative and passing light through it. One of the purposes is to increase the contrast so that the image of the man would be better visualized. It may have also been used for reversing images (photo reversal) from black and white negative films to positives transparencies and for copying negatives. Some examples may be found in group d; Face & Chest, Positive & Negative, as well as in other groups in this section. Some photos are “notched films”. 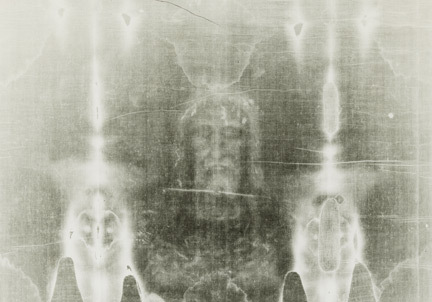 This could be an original picture taken of the shroud or it could be a photo taken of another photo or a group of photos such as was possibly done to create some of the high quality full images of the shroud as noted above. Once three films of the Shroud were put together to create a full sized image (a mosaic), a photograph was then taken of these three films to make one photograph of the Shroud. “Notched films” are not high contrast contacts, but are original films taken by the camera. Several notched films are scattered through this section. Matched films as they relate to the Shroud, are defined as three images of the Shroud produced in exactly the same way so that one can make a full image because each part is captured by the camera with exactly the same level of light exposure etc., as the others or have been produced by using the High Contrast Contacts technique as discussed above. The photos in group e, Matched Three Piece Full Images, are examples of “matched photos”. These are the three parts that would make up the mosaic of the entire Shroud. But as yet these films have not been cut and placed in sequence to create the single photo of the Shroud. Unmatched films are defined as one or two of the three parts of the full mosaic (3 parts make up the entire Shroud) that were produced in the same way as matched films were with a certain exposure to light etc. but there are no other parts that display that same exposure. In other words they remain unique and cannot be matched up to any others to make up a full mosaic of the Shroud. The photos in group f, Unmatched Images, Positive & Negative, are examples of “unmatched photos”. Some of these were experimental exposures that Vernon was doing in order to derive the best exposure time, etc. to obtain the best contrast, etc., so as to produce the clearest positive and negative images of the Man of the Shroud.